Contrary to belief, I personally believe that bowl of cold oatmeal first thing in the morning is a refreshing, satisfying, and wholesome breakfast option. This modern (and super-easy) spin on Swiss Muesli serves up uncooked oats, a double dose of dark cacao, and of course, almond milk for a power vegan breakfast. It's a nutritiously raw and no-fret recipe since instead of cooking oats, they are soaked in the almond milk until its nice and soft. And since it's made with Origin Almond, you can be assured that our almond milk is pure as an abundance of 100% raw, organic, non-GMO, unpasteurized almonds. None of the funky additives (carrageen, lecithin, etc.) or excess sugars & salts of the other commercial brands. 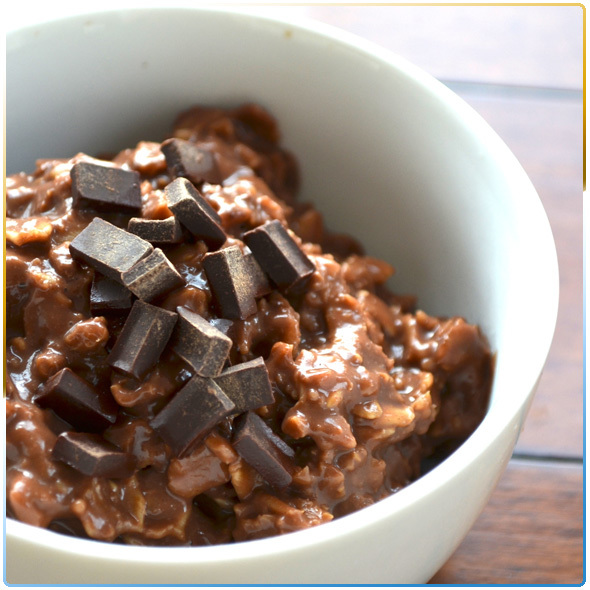 In a bowl, mason jar, or other container, combine oats, dark cacao almond milk, dark cacao almond freshly ground almond meal, and cinnamon. Cover and place in the fridge overnight. In the morning, scoop out the soaked oats into desired portions. (be sure to savor the chocolaty aroma!) Sweeten to taste using agave, sugar, or other sweetener. Top with garnishes and enjoy! Raw, Unpasteurized Almonds: Our ultra-pure almond meal & almond meal is made up of Origin Almond’s 100% raw, organic, Non-GMO, & unpasteurized almonds. Aside from nature-intended deliciousness, it’s also highly nutritious as a natural source of protein, fiber, Vitamin E and magnesium. Dark Cacao: cacao is a renowned nutrient rich super food that’s a natural source of magnesium and antioxidant flavanols and polyphenols, protein, fiber, B-vitamins and other key minerals. Origin Almond uses Criollo Cacao beans which are revered as the highest quality variation of cacao representing only 1% of the global production—it lacks the bitterness of standard cacao but offers an incredibly decadent chocolate taste.